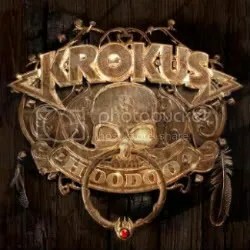 It’s appropriate that the production on this album sounds about as vintage and as old school as you can get… because that’s exactly the type of rock music Krokus is playing on this collection of cover songs. The idea behind Big Rocks was the band wanted to pay tribute to the bands and songs from the 1960s and 1970s that influenced them: Queen, Led Zeppelin, Black Sabbath, Steppenwolf, The Who, Rolling Stones, etc. Krokus can’t help but make all of these songs a bit heavier and a bit gritter. All of these songs are still totally recognizable, but a few have been beefed up and given a bit of a heavy metal makeover such as The Animals’ “The House of the Rising Sun” and The Rolling Stones’ “Jumpin’ Jack Flash”. Krokus has reworked these songs to fit in with their own material and it’s fun to hear a different voice applied to the songs. Mark Storace certainly has distinctive enough vocals to make this album an interesting listen and you can’t complain too much over a tracklisting that looks like a ‘greatest hits’ compilation of classic rock. Inexplicably, Krokus decided to close out the album by covering themselves. “Backseat Rock N’ Roll” originally appeared on Metal Rendez-Vous in 1980. Again, the sound beefier sound, but I’m not sure why it was re-recorded. I guess someone really didn’t like how the original version came out? All told, Big Rocks is a fun album of cover tunes. 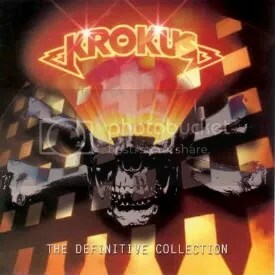 I have owned The Definitive Collection, a Krokus compilation album, for a number of years. I liked it but never got around to checking out their catalog. As a whole, judging by critics, the career of Krokus has been a mixed bag and that may be partly why I have never checked them out further. Honestly though, once news hit of Hoodoo coming, I added a number of their albums to my CD Universe wish list but still never got around to buying them. I’m not sure why but despite my inexperience with the band, I had a good feeling that Hoodoo was going to rock. I knew 2006’s Hellraiser was universally praised so I figured they would be able to continue the momentum. It’s a bonus that this album is a reunion of the Once Vice at a Time line-up from 1982 (longtime singer Marc Storace is the only holdover from Hellraiser). This is easily one of the best albums I’ve heard so far this year. It rocks from beginning to end. Krokus may be veterans in the world of rock ‘n’ roll but you wouldn’t know it here. The sounds are full of energy and the band is fired up. Of course, you can’t mention Krokus without talking about the obvious AC/DC influence. My woman came home the other day while I was listening to this and asked me why I was listening to AC/DC (since I usually don’t buy or play many of their albums). The similarities with AC/DC seems to be one of the main causes for the flack the band has caught over the years but so what if they sound like AC/DC? Like that’s a bad thing? Especially when this album sounds like the Bon Scott era? “Drive It In” is a great opener but it’s when “Hoodoo Woman” hits that you know Krokus isn’t playing around. It’s an infectious song. One of the band’s calling cards is doing covers. Well, they did it again by covering Steppenwolf’s “Born To Be Wild”. I’ve never been a fan of song but I like Krokus’ version. “Rock ‘N’ Roll Handshake” is my favorite track, some great riffing to be found here and the next track “Ride Into the Sun” is my second favorite song and is a slow burner similar to “Screaming In The Night”. At the album’s half-way point “Too Hot” is up and it reminds me of KISS’ “Lick It Up”. “In My Blood” is another highlight for the album, “Dirty Street” is probably the bluesiest rocker of the bunch. “Keep Me Rolling” and “Shot Of Love” are the two weakest tracks on the album but still pretty good, so I’m not knocking them and “Firestar” is a powerful and spirited closing track. I can’t imagine this album not making many top ten lists come January 2011. Hoodoo is full of bluesy hard rock anthems that are sure to please and it has definitely convinced me there’s no time like the present to check out their earlier material. I stay away from greatest hits packages these days because often its the “deep tracks” that are most worthwhile, but as a sample platter, they’re worth a spin to find out if the band is your taste. I do like this album, but I’ve yet to ever get around to picking up any of the Krokus’ other albums, for whatever reason. So not being familiar with Krokus (outside of the hits), I’m not sure how “definitive” this release is, but it works for me even if their covers of “Ballroom Blitz” and “American Woman” are horrible. That’s not really their fault though, I hate the originals too. They do a decent cover of “School’s Out” though.